Dell Inspiron 700m laptop computers have an occasional problem with the internal speakers going dead. The drivers and audio control panels will all be working fine, and the headphone jack will work, but the speakers along the bottom edge of the screen will simply not output sound. This can be the result of the speaker wires fatiguing and breaking where they pass through the hinge from the base to the screen. If you've just noticed that the speakers died recently, you can potentially tell if the wires are the culprit by closing the screen most of the way while playing an audio source through the (non-functioning) speakers. As you get the screen nearly closed, the sound will magically come out of the speakers if the broken wires make contact with each other. Now if you have a warranty, it would be a good time in invoke the warranty repair system and get this fixed properly. I bought my laptop as cheaply as possible and skipped the warranty in the process. I got to fix the problem myself. To start with, Dell is kind enough to have partial disassembly instructions available on their website. I'm not sure how you'd find these normally, but I found a direct link to the page after searching Google for a while. My next step, armed with these instructions, was to get into the computer and see what the problem was. I pulled off the bezel that sits along the top edge of the keyboard to start with. This bezel covers the hinge area, and as soon as I took it off, I could see the broken wires. Unfortunately, there's not much to work with at this point, so further disassembly is necessary. Following the instructions on the Dell site, I removed the keyboard to make some working space. This allowed me access to the speaker wire plug on the motherboard. The Dell disassembly instructions don't cover the removal of the screen-surround bezel on the 700m. It was necessary to remove this to get at the speakers themselves. Under each of the round rubber feet on the screen surround sits a screw. You can remove all these screws. 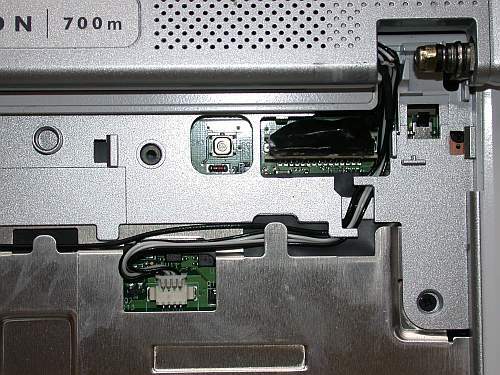 Then you need to get at the hidden screw next to the wireless network LED at the bottom of the screen surround. You can access this screw by using a fine flat blade screw driver to peel up the silver sticker seen in the picture below. After removing the screws, you should use stiff, thin plastic tool (perhaps a credit card) to work the seam around the screen bezel. There are a series of plastic snaps that will unsnap when you work them with the tool. After they're all snapped loose, the bezel comes off. At this point I removed the right side speaker, and undid the circuit board between the two speakers in order to pull the right side speaker out far enough to work on it. The wires for the left speaker actually run through the right speaker housing, across under the circuit board, and into the left speaker. The next step was to solder the broken wires back together. I stripped the ends of the wires, and added a short 3/4" long section of wire between each break to make up some of the lost wire length. Each wire got a section of shrink tubing put on after soldering back together. The bundle of shrink tubing makes the wiring bundle thicker than it originally was. This necessitated some further modifications to make the computer fit back together. I used a Dremel sanding drum to grind away a section of the hinge bezel to give the wires some room to flex. After test fitting everything, I put the computer back together. The computer is now slightly less attractive than it used to be, but at least the speakers work again. I expect that after a few hundred more open and closing cycles the wire repair will crack again, but at least now I know what it takes to fix things. Graduate student in biological sciences. Studying biomechanics and rocky intertidal ecology.